I think this is my favourite of the many songs I’ve written with Brian Chin Smithers. For years Brian and I got together once a week to write songs and we must have written, though a lot were never finished, a couple of hundred. My recollection is that it was usually a Wednesday but it happened whenever we got together with a guitar or keyboard up until the time he moved to Brighton. In the years since, on the all too few rare occasions we meet up, we still write songs and he’s the only person I’ve ever successfully, consistently written with. I have demos of many of them recorded on to a wonderful 8 track Tascam 688 for which I have Dominic Walker to thank. The song, though it doesn’t sound like it was, in my mind at least, inspired by Bob Marley’s High Tide or Low Tide and I remember we rediscovered our idea for it after not coming up with something we liked and so went back to sketches recorded on cassette at some earlier time. We finished it pretty quickly once we had found it. The lyrics are about Mother Nature the closest thing I have to a religion. Brian was in Brighton by the time I recorded it but I had a midi file of his keyboard parts and lovely Mike Hunter sampled Mansun’s mellotron for me. Love the sound of it. I recorded my vocal at 10 in the morning at Andy Wilson‘s Hype studio and it was my attempt to sound like Smokey Robinson! Doesn’t quite get there… Martyn Campbell was boss with his ideas for the song, Lizzie Nunnery popped in to sing some bvs and Tony McGuigan played them drums. Feel the rain that’s why she made it. That’s why she made it. Robert Harris is a writer whose books I’ve enjoyed for years although I sometimes belittle him with faint praise; ‘he’s a great thriller writer’ that kind of thing. That said, he is a great thriller writer but he’s often so much more. Known predominantly perhaps for the excellent Fatherland, his rich body of work includes the Cicero trilogy – an absolute feast for lovers of Ancient Rome – and a thinly disguised portrait of an ego driven Tony Blair in The Ghost. I was a bit disappointed with his last, Conclave but his latest novel, Munich, is superb. The novel concerns Chamberlain and Hitler and the events leading up to the infamous ‘peace in our time’ proclamation by the now much derided British prime minister. 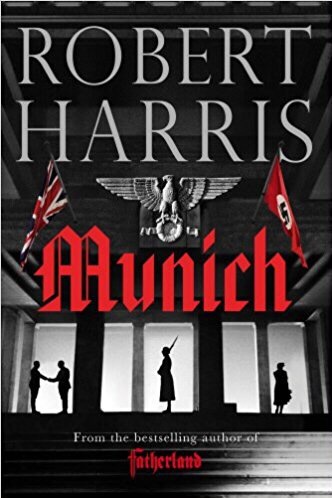 Harris addresses the Munich agreement from a different angle than the usual appeasement one and the book reads like an argument for the PM as a force for good at a time the forces of evil and war where in the ascendancy, and it’s a convincing argument. The story is driven by the relationship between 2 civil servants, one English the other German, who knew each other from their days together at Oxford, and the role they play in the cauldron of late 1930s world affairs. The overriding message of the book seems to be that Chamberlain was, contrary to conventional historical opinion, no spineless fool and Churchill’s eventual success should not have come at the expense of Chamberlain’s reputation. To the victor the spoils, alas, is an ongoing tragedy throughout history but the greatest tragedy here is Chamberlain’s quest for peace failed and in retrospect was always doomed to failure. Nowadays, with Neo Nazis seemingly everywhere you look, it would take more than a peace of paper to get us to believe we had peace in our time, but only 20 years after the first great world war, people had to believe another could be averted. Chamberlain was certainly one of those and perhaps that’s the worst thing that can be said about him. Highly recommended if you like thrillers, espionage and an intelligent reading of history. 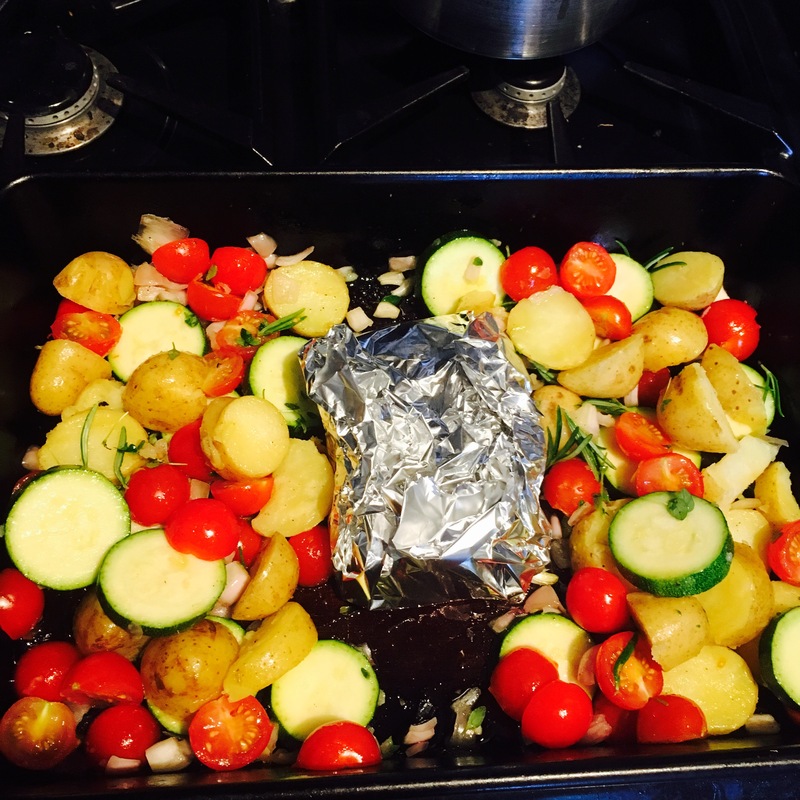 Halloumi bake with roasted veg. I love cooking. I love cooking once I know what I’m doing. 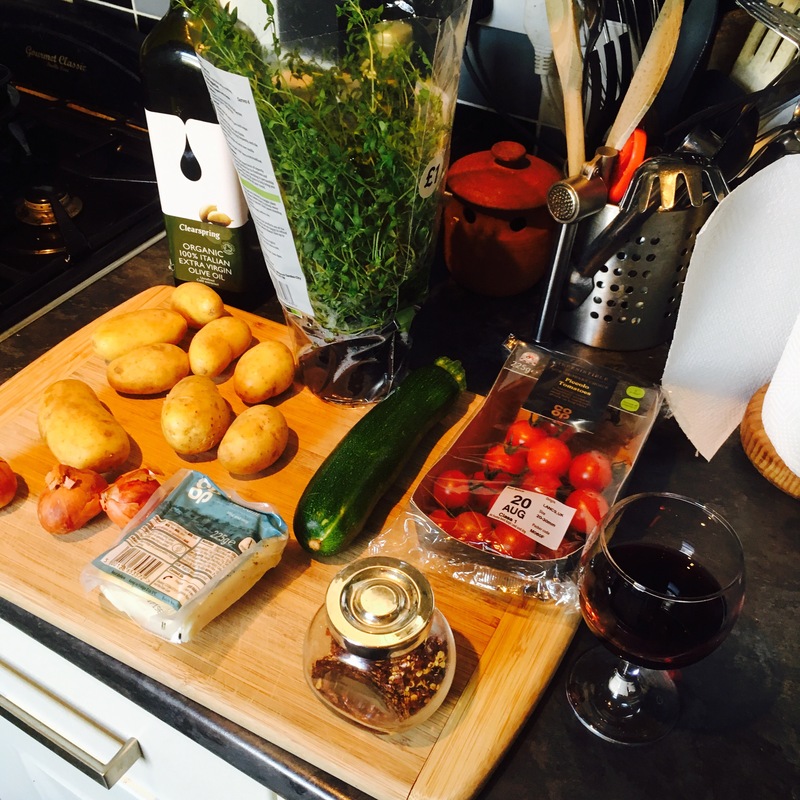 I love cooking with a glass of wine at the ready and some great music or radio programme playing. In a pathetic attempt to garner more eyeballs to my site I thought I’d share the occasional recipe via the blog. I’m getting ready to go on my hols and as much as I enjoy being elsewhere I love being at home. Cooking, drinking wine and listening to great stuff. But needs must so in celebration of great holidays I’m having a Mediterranean scran tonight. 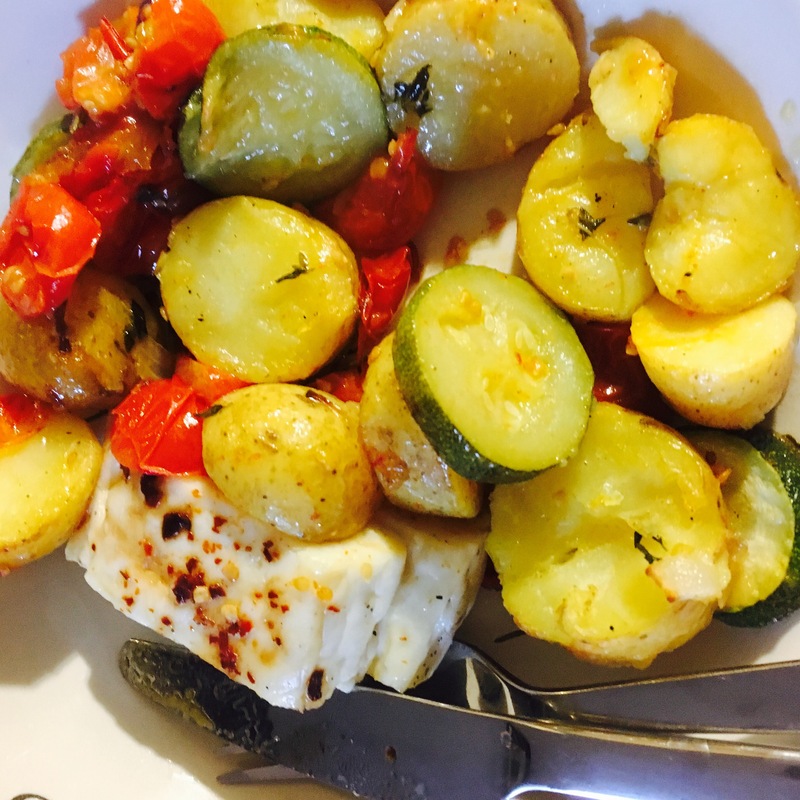 I’m a vegetarian for the most part and this is tasty as you can get : baked halloumi with roasted veg. Ingredients, but you can use what you like really. 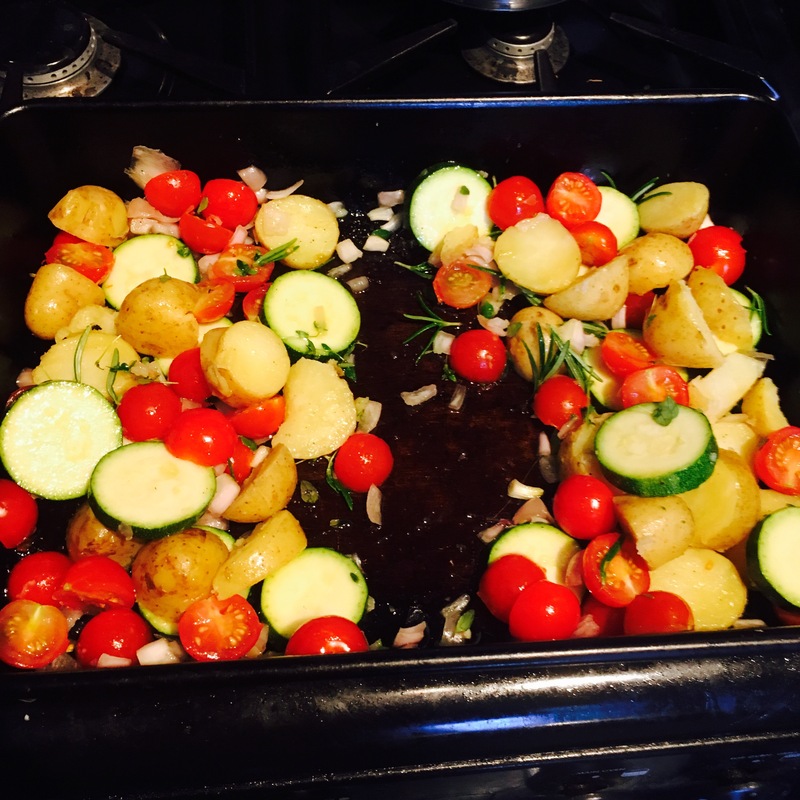 Tomatoes, new potatoes, courgette, shallots, rosemary, thyme, chilli flakes and halloumi. There’s barely any cooking involved. Chop the spuds in to smallish chunks and parboil them for 10 minutes or so and in the meantime heat the oven to gas mark 6 or 7. Cut the toms in half, I like the small vine ones, slice the courgette and the shallots, put them in a roasting tray with olive oil, salt and pepper, rosemary and thyme. When the spuds are done add them, fling everything together and part in the middle, like Moses and the Red Sea. 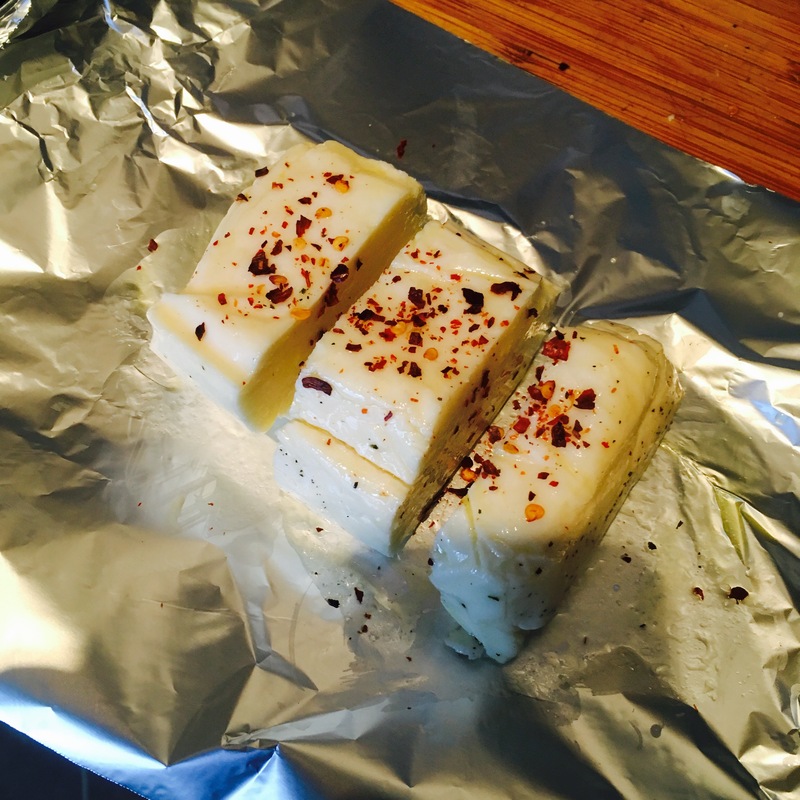 Cut your halloumi in half, place the pieces on a big piece of kitchen foil, pour a bit of olive oil over them and sprinkle chilli flakes. Then do the foil up in to a parcel and place it in the roasting tin where you did your Old Testament miracle. Bung in the oven for 30 minutes or so, stirring half way through. Eat. Go on holiday and relax. Recipe stolen from Nigel Slater but messed about with.